Set in City, this book tells in six short stories how Mayor Moe and the Councillors try to solve the city's problems with new laws, how sometime these new laws have unexpected consequences, how every single law has an impact in citizen's rights and freedoms granted by democracy, and how difficult can be sometimes know what it's really fair. In a way easy to understand by kids, laws such as freedom of religion, the right to privacy and the right of equal treatment are explained. 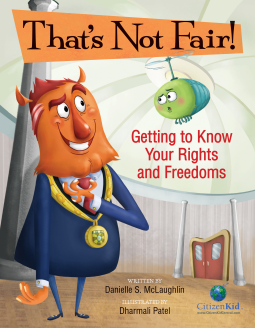 Kids are strongly encouraged to think critically each time they think something is unfair, trying to answer questions like "Why was the law made? Will it work? Could there be unexpected results?" I really loved this book, and think its approach is amazing. Usually topics related to politics and citizenship are not kids' first choice, but I would say "That's not fair!" it's a winner. I'm glad not only I read this book, but I discovered through it the CitizenKid series.